This stool is extremely good looking, and it surprisingly very comfortable! Great quality as well. 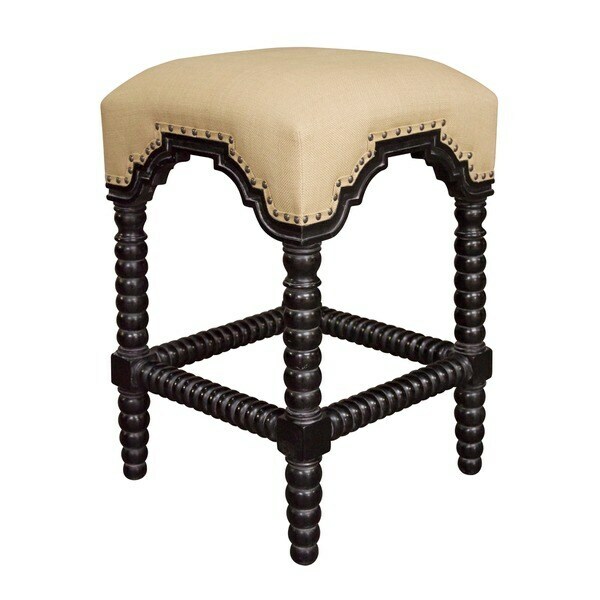 Bring some sophistication to your living space with this elegant ridge-legged black counter stool. It uses sturdy, hand-rubbed mahogany wood and a complementary beige upholstery that's a great addition to your home. There were perfect for my setting. I was amazed at how well they were packaged and they arrived in a very short time. I have to say that I am pleased with these stools. They look awesome. I ended up ordering five of them. The material got dirty from little hands, but I gently used soap and water and washed away the sticky spot. You can't tell where it was since they clean up well. I had checked all over the internet and Overstock had the best price anywhere. I also joined the "O" club and saved on shipping **** and used the points for the next order! Even better! I love these stools! I had the bar height version before moving and had to wait months for the black counter height version to be in stock, but I now have 4 of these. They are a bit shinier than my previous stools (less of a hand-rubbed look), but they are still beautiful and I can dull the finish myself if I want to. I have been shopping for Abacus barstools for over a year, Horchow, High Fashion Home, etc. Some places sell these for $***. The price is great, they were packaged carefully, no damage at all. Very sturdy. Could NOT be happier with the purchase, they are the perfect seats for our new kitchen. Impressive looking counter stools! I’ve received many compliments. Love them, but would recommend scotch guarding, as the linen is a light beige. Wish they still had the black in stock - I’d grab a few more! Not hand rubbed as advertised. These bar stools are wonderful and exceeded all of my expectations! They are a perfect addition to our kitchen. They are well made, the fabric is such a great neutral color and the details on the stool are so unique and pretty! LOVE THEM! I'll be purchasing another one. Great addition to my kitchen island. The whitewash is beautiful. Very lightweight, but still very good quality for the price. Frontgate and other catalogs have similar for double the price. It's the first counter stool I've ever owned that is actually comfortable and makes me want to sit at the island. Design is absolutely perfect for beach coastal vibe. Another great purchase at overstock. Using it in my bathroom as my make-up counter stool. It's a great look, sturdy and complements the decor perfectly. great quality, comfortable,looks great! No assembly. I looked at a lot of bar stools. This one was just what I wanted. I got the white washed stool. At first I was afraid it was going to be a little too white but when I got them into place they were perfect! The quality is excellent and far above many I saw in stores. Sturdy and roomy. So glad I purchased them! These have been the best bar stools! I found similar ones at Neiman Marcus for 3 times the price. We use them daily and they are very easy to clean. These are similar to a high end version sold at Horchow, but look fantastic. The quality and design is gorgeous. My only complaint is that we weren't immediately in love with the fabric for the seat, but that can easily be reupholstered as you can't beat the price for this item! Thes stools cost more than I wanted to spend, but they were well worth it. They are so beautiful at our kitchen island. I absolutely love them ! These stools were a perfect fit for my home bar. They are very unique and I always receive compliments. I have always loved these bar stools! I ended up having to return them however because they were a little shorter than we wantedThey were great quality and beautiful. "When will the black be back in stock?" We will have the black option available in the next couple of days. Please check with us. "How much weight can a bar stool hold?" "When will you be getting the Ridged Leg Nailhead-trim Hand-rubbed Black Counter Stools in? There are only 3 whitewash available and I need the black." We do not have the black at this time, but have 4 white washed stools. We do not know if they will be restocked. "What does the stool weigh?" This item weighs approximately 21 lbs. I don't know the exact weight but it is very sturdy and has some weight to it. "Hello ...what is the seat height? thank you"
The seat height is approximately 24 inches. The stool is beautiful and it matches my decor!!! "How high is counter height"
Hello tina, counter height is approximately 36 inches high. These stools are 24 inches high. Have a great day!